Turkey is delicious, healthy, meat diet. It is easily digested and absorbed. Sets it apart from just another great taste. When preparing Turkey , use additives such as dried apricots and raisins. These products give the meat flavours and are an additional source of potassium. Turkey meat will become more tender, if before cooking the inside to RUB it with lemon. Prepare the sauce and then soak the slices of fillet of a Turkey. For its preparation take a small pan, fill it with water. Add the sugar, salt, pepper, cumin. Stir. Peel the onion. Take the cut Board, cut two onions in half. Then take a garlic press and squeeze 4 cloves of garlic. Add the garlic and onion in a pan. Stir. Then put the fillet of a Turkey cooked in the sauce and soak it during the day. Soaked the fillets , remove from solution, rinse, dry. Take the cut Board and cut the Turkey into serving pieces. Put the pan on the fire. Pour it in vegetable oil and fry the fillets until lightly crisp. Then slightly fry the mushrooms. While meat roasts, prepare the sauce. To do this, take a pan, pour a little oil and sprinkle flour. A little fry. Add the flour, sour cream, half a Cup of diluted chicken broth and a glass of white wine. Mix. Bring to a boil. Once the sauce will become smooth, remove it from the stove. Take a lemon, cut it in half. Squeeze the juice from one half. Then take a grater and finely grate the cheese. In prepared sauce add the lemon juice and butter. Take a heat-resistant form, fold it filet turkeys. Pour over cooked sauce. Put on the sauce and sprinkle everything with grated cheese. Close the form with foil and put in a preheated 200?With the oven for 15 minutes. Then, remove the foil and with the formation of a Golden brown, remove the finished dish. Serve Turkey breast is possible with vegetables, rice and white wine. To measure the temperature inside the poultry, it is convenient to use a special thermometer for roasts. If you bake the stuffing or side dishes on the same platter that the Turkey, then add it only for 30-50 minutes before estimated time of readiness of the birds. To ensure the readiness of the bird, skewer it with a wooden stick. The resulting juice should be clean and clear, containing no blood. When the bird is done, remove it from the oven and leave in a warm place for 20 minutes, covered with foil and towel. Meat Turkey is extremely nutritious and diet product. Of course, it is not as widespread and available as other varieties of game, but if you try, it in the major supermarkets of the city can be found and Turkey. 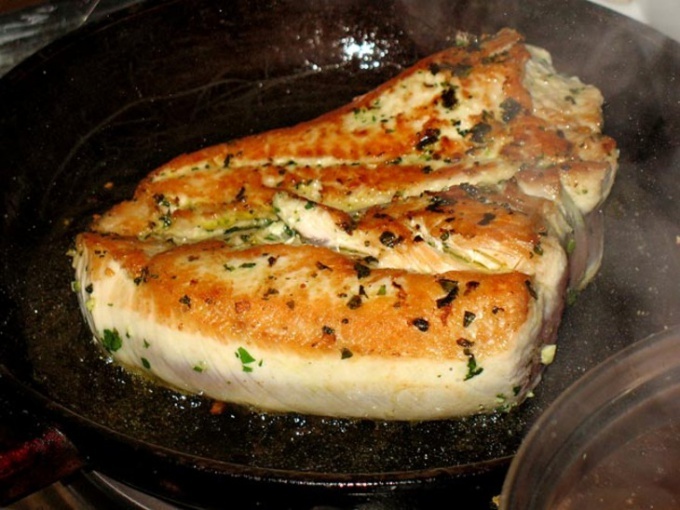 To cook fillets Turkey brand is easy, as it is very similar to filet of chicken, and recipes today quite a lot. Steak with cottage cheese. Fillet of Turkey wash, dry and slightly repel. Make small but deep incisions for the stuffing, season with salt. Basil wash, dry and chop. Mix it with cottage cheese, pepper and stuff a fillet of a Turkey. In a pan, fry received the steaks on both sides in low heat for 15-20 minutes. Serve the finished steaks with vegetables and fresh herbs. 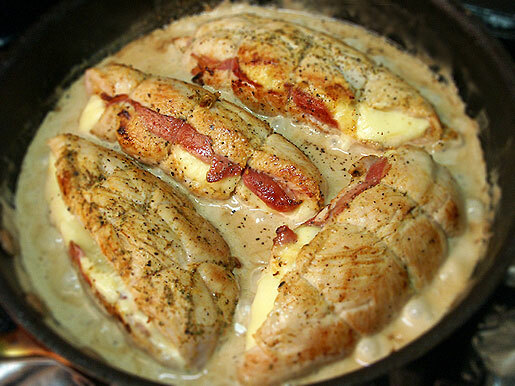 Stuffed fillet of Turkey. Apples wash, peel and core. Slice them into strips. The prunes, boil for 10-15 minutes, remove bones and chop. Mix the apples, prunes and the necessary amount of sugar. The stuffing is ready.Fillet of Turkey wash, dry and whisk lightly, then season with salt. In the middle of a fillet put some of the filling and wrap the envelope. Dip the envelope in flour and eggs, whipped with milk. 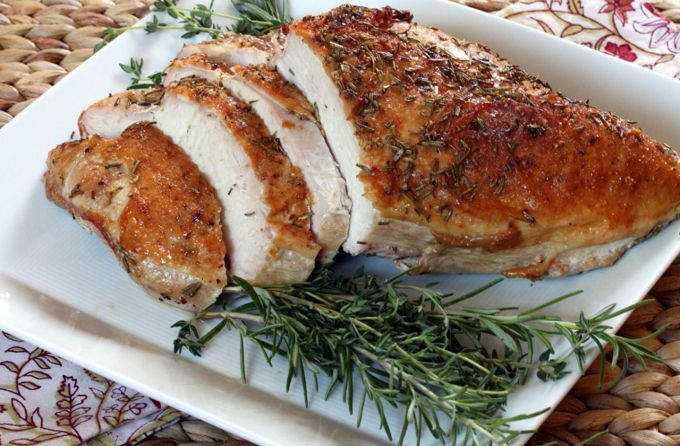 Fry the stuffed fillet of a Turkey on low heat for 20-25 minutes until fully cooked. The resulting dish is garnish with a sprig of fresh herbs. Turkey with peppers and mushrooms. Fillet of Turkey wash, dry and cut into pieces small size. Add salt and fry them in vegetable oil for 15-20 minutes. Onions and mushrooms chop and fry in butter. Sweet pepper wash, remove seeds and cut it into squares (2X2 cm). Sauté peppers in vegetable oil for 5-10 minutes. Mix onions, mushrooms and pepper and serve as side dish to filet turkeys. Turkey with mushrooms. Fillet the Turkey rinse, salt and pepper. Mix the cream with the sachet of dry soup and add canned mushrooms. Lay fillet in pan and cover with mushrooms in cream. It should bake in a preheated 220 degree oven for 30-40 minutes. Roasted Turkey breast is very tender and juicy dish that is prepared simply, quickly marinated and quickly cooked. It requires a minimum number of available products that can be found in each fridge. Turkey breast weighing 1.2-1.5 kg (one piece). A piece of meat to wash under running water, dry with paper towel and lightly wipe off the salt. In the prepared meat with a knife to make small incisions. The cuts must be across the surface of the meat and from all possible sides. Lemon cut into two parts. One part for some time to put aside, and from the second part to extract the juice. Note that you can not get juice, and just cut a half of lemon into thin slices. In a deep capacity to combine the yogurt, juice from ½ lemon or slices of lemon, spices and herbs. All mix thoroughly until smooth. The finished kefir weight becomes a marinade for meat. A piece of Turkey dipped in marinade, refrigerate and marinate at least 3 hours. During this time the meat should be flipped so that it is evenly marinated from all possible sides. The oven turn on and heat up to 150-180 degrees. Remove meat from marinade, place on a piece of foil, tightly wrap, place into a baking dish and bake for 1 hour. During roasting of meat will stand out a lot of juice. Do not be afraid, as it should be. This juice will be present in the baked meat. Ready juicy Turkey breast remove from the oven, deploy, cool slightly, cut into thick slices, serve with garnish or fresh vegetables. Note that from this meat, you can do a cold platter or a juicy cold sandwiches.